MD Tattoo News and New Tattoo Products! What’s up everyone! I’ll be updating my website with news, new products for tattooists and collectors alike, as well as some thoughts regarding various tattoo related topics. Be sure to keep checking my website for updates! I’ll be covering a wide range of topics at times to help educate tattoo artists or aspiring tattoo artists. I will also discuss things to think about when getting tattooed, as well as my random thoughts on things. It’ll be unfiltered, short and sweet, and straight up! Thank you for all of the love and support throughout the years! 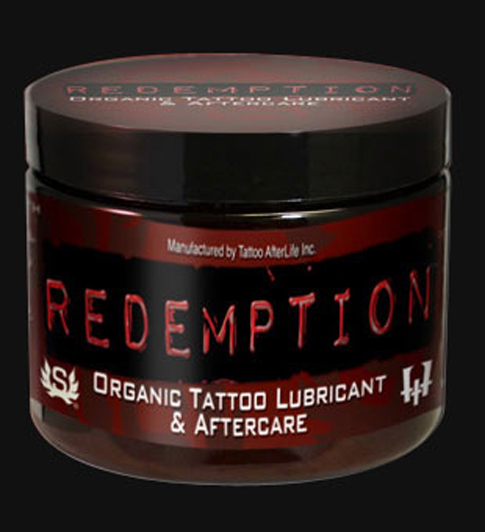 Redemption Tattoo Lubricant and Aftercare- First and only USDA certified petroleum replacement developed specifically for tattoo artist and collectors. Use during the tattoo process and as aftercare. It is completely petroleum and chemical free and helps sooth redness and swelling. Helps prevent infection, won’t clog pores and it’s easy to spread. Used by thousands of leading tattoo artists! Check it out - you won’t be disappointed! Click here to order Redemption! Magic Stencil Marker- Introducing a revolutionary new product for tattooing! Stencil eraser, detailer, blender, marker… ALL-IN-ONE! Non-toxic, disposable, single use, no cross-contamination! You can now erase tattoo stencil lines quickly! You can also blend and detail tattoo stencils. Use the Magic Stencil Marker with carbon paper. You simply rub the tip onto carbon and like magic this product turns into a purple marker for freehand stenciling! Comes in packs of 24! Click here to order your Magic Stencil Markers! Tadu Tattoo Daily Moisturizing Lotion- Protect and help preserve your tattoos with our specially designed moisturizer that combines the protective elements of sunscreen (SPF 35+) with the benefits of a daily moisturizing lotion. Non-greasy formula provides daily skin protection while helping preserve your ink. Protect your investment with TADU: The ultimate in daily tattoo defense. Click here to order your TADU!